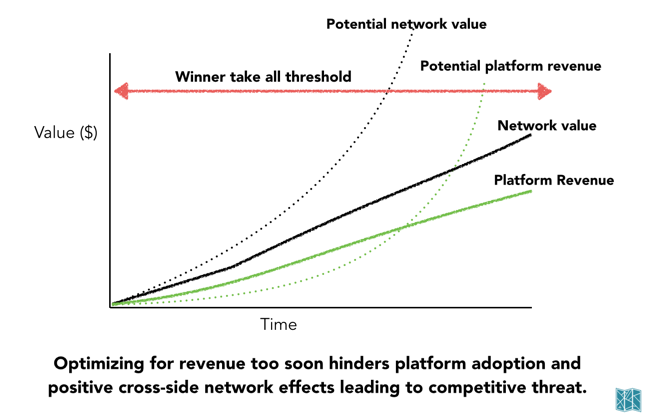 TLDR: Properly applying platform growth tactics means prioritizing network value over revenue and constantly finding ways to exert leverage from each side of the market. Holding one side of the network static and creating attractive features is a common way to kickstart a platform. After demand is created pricing subsidies applied to more price sensitive side of the platform let you get more users which you can leverage on the opposing side of the platform. Sometimes you need to prioritize high value users though in order to get over growth humps and motivate opposing side users. From reading a variety of research, I’ve found there are a few tactics that are typically utilized by the platform creator. Each of these tactical levers are used strategically to stimulate growth, manage quality, operate more efficiently and optimize positive network effects. What are some commonly pursued platform growth tactics? What should my north star be when building a platform business? How do I get started building a platform? How should I think about pricing and what type of pricing should I implement? In a platform business, there are two sides that we are creating value for. 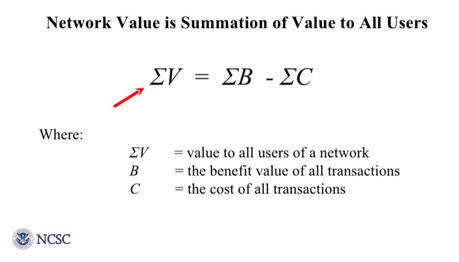 We can think of network value as being the combination of value generated for both sides. What would the world be like without your platform? What would all of the costs be to each side of the platform? For instance, if there were no Airbnb, users would be paying more for hotel rooms, potentially staying farther from expensive areas and spending more on travel, etc. So long as possible, it is important to think in terms of network value instead of revenue in the growth stages of a platform. 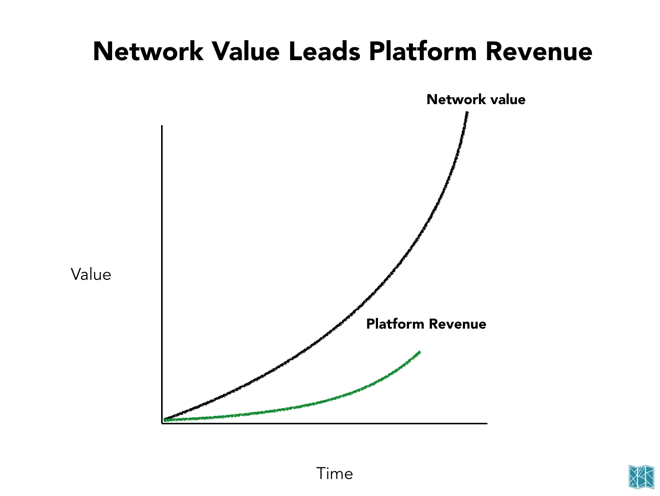 Revenue lags network value. This is because revenue collection acts as friction to platform adoption. The more you can increase network value while creating as little friction as possible, the more you can compound the positive cross-side and same-side network effects. If your objective is to build a winner-take-all marketplace over a very long term, you want to build a platform that has the least amount of friction (both product and pricing). High rakes are a form of friction precisely because your rake becomes part of the landed price for the consumer. If you charge an excessive rake, the pricing of items in your marketplace are now unnaturally high (relative to anything outside your marketplace). In order for your platform to be the “definitive” place to transact, you want industry leading pricing — which is impossible if your rake is the de facto cause of excessive pricing. High rakes also create a natural impetus for suppliers to look elsewhere, which endangers sustainability. What this means is you need to be very strategic in applying strategies in order to optimize network value. Which strategy is right at any given moment depends on which will have the highest impact on network value. We can look at these strategies applied over time and visualize them on a timeline tied to platform value. 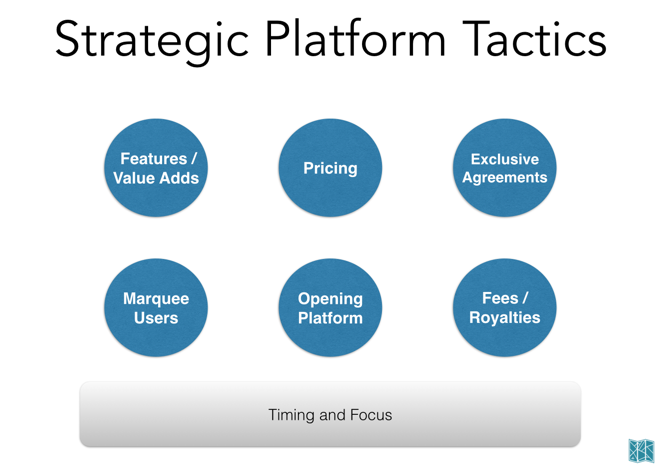 And you can analyze other platform businesses by the strategies they apply over time. By constantly asking, “where do I have leverage?” and “how can I use this leverage on the other side of the market?” using the strategies outlined below. In many ways its also like catalyzing a chemical reaction: more on that here if you want to ponder it. So what are the tactics? Broadly they seem to fall into two categories. Adding value explicitly for one set of users on one side of the platform to generate demand which can be used as leverage. Value add — Create value directly for one set of users through features in order to attract them to the platform. And once demand is generated by managing access to the platform through various means of price, contracts, fees, and priority systems, leverage can be applied strategically. 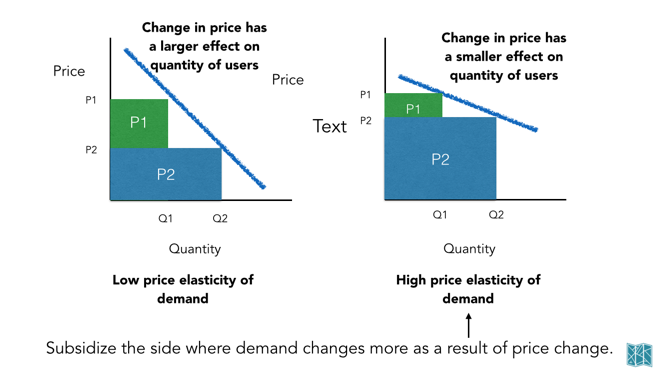 Pricing — Pricing directly affects the quantity of users on either side of the platform. Generally you focus revenue acquisition on the side that is less sensitive to price change and apply subsidies on the other side. Exclusivity — Lock some users in to prevent competition and give your platform a competitive advantage with sustainable margins. Openness —Opening up the platform can allow for scale but bring quality issues and need for new processes. Marquee users — Sometimes it takes acquiring some very high value users (vendors, customers, etc.) to push the other side of the platform to act. Adding value to one side of the platform is often the first tactic applied to kickstart a market. You need some way of attracting an initial set of users which you can then leverage against the other side. Often times the features you build to kickstart a platform include a subsidy, for example, Uber managed the initial request matching with black cars manually, this in essence is the application of a subsidy to the supply-side. Since the opposing side of the market won’t want to join the platform until there is value, it’s usually necessary to manually roll in the opposing side into the initial offering. 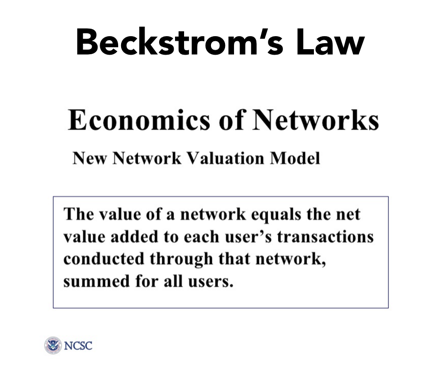 In terms of the demand-curve, adding value to one set of users acts like a same-side network effect shifting the demand-curve out for that market, which tends to create a cross-side network effect as demand is generated. 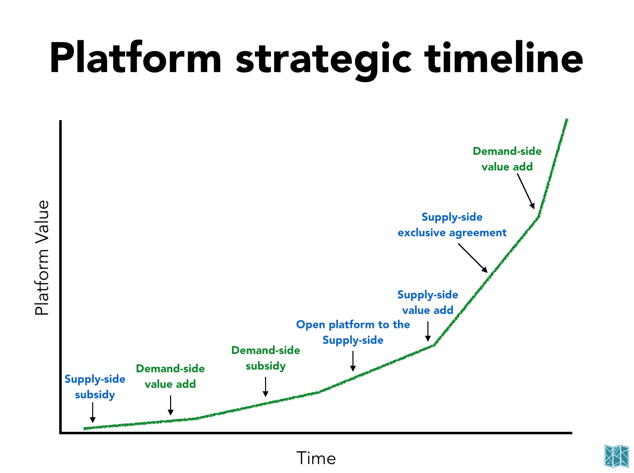 Most of the time the initial challenge for the platform builder is to generate demand-side interest. However, some companies start with demand-side interest such as Airbnb — lots of people were already traveling to cities and looking for places to stay when they started. Their main challenge was generating supply-side interest which they famously hacked through craigslist. Generally, it makes sense to subsidize the network’s more price sensitive side and to charge the side that increases its demand more strongly in response to the other side’s growth. In economic terms we can think of this as the side with the more elastic demand curve or the side that will yield the highest quantity of customers with a change in price. When creating the PDF standard, Adobe started out charging both the content creators (people who wanted to create and distribute high quality digital content) and content consumers. They eventually decided to make the PDF reader free in order stimulate supply-side interest. The side that yields the strongest network effects can also be the side that is bringing value to the platform. We could think of this as the side that’s bringing new features onboard which broadly increase demand. Often one side of the platform will be the primary revenue source. This phenomenon is common because once you attract hard to obtain users on one side you have leverage to extort value from the other side. In real estate sales, it would be hard to get a buyer to pay a buyer’s agent if they had to pay out of pocket or up front. This market has evolved such that the seller pays both the seller’s agent, the brokerage, and the buyer’s agent upon completion of the sale. Sellers are generally the one’s receiving a large sum of money with profit and it is much easier and effective for the platform to take a cut of their payout versus charging buyer’s upfront. The table below outlines quite a few examples of this. How should you apply pricing? Access or usage based pricing? 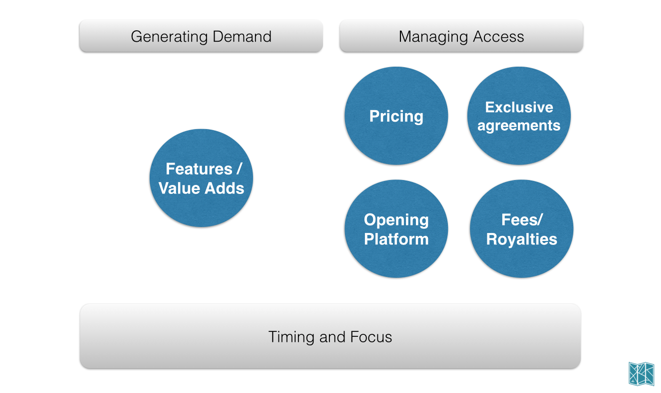 Pricing can apply in two ways by access, usage, or both. 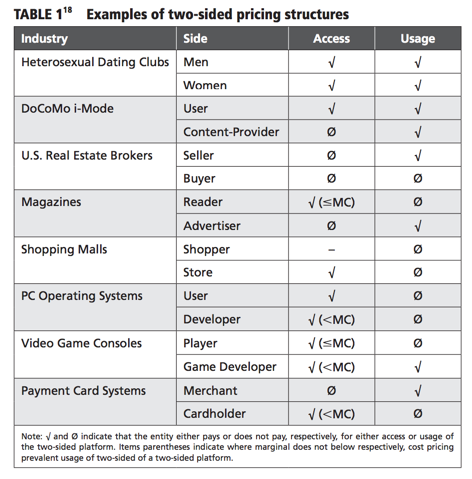 For many platforms it is possible to charge two different kinds of prices: an access fee for joining the platform and a usage fee for using the platform. Although these are interdependent, one can think of the access fee as mainly affecting how many customers join the platform and the usage fee as mainly affecting the volume of interactions between members of the platform. Most software platforms charge access fees to users — they have to license the software platform but then can use it as much as they want — and do not charge access or usage fees to developers. 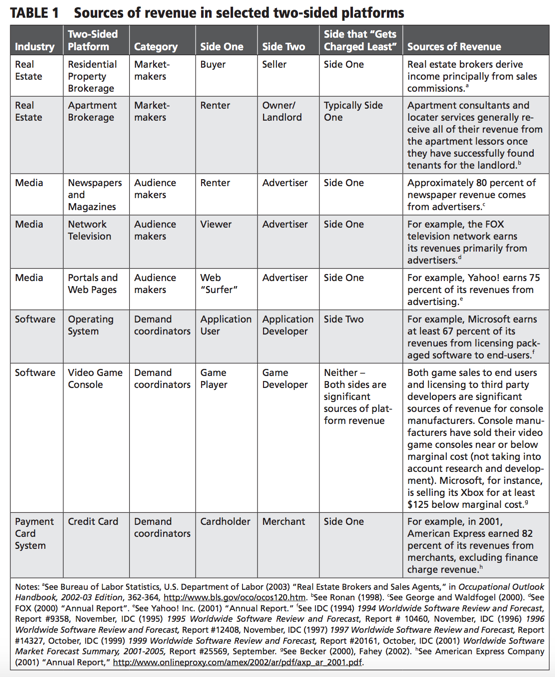 Videogame console vendors, though, charge a usage fee to game developers — a royalty based on the numbers of games that are sold; users pay this usage fee indirectly through their purchase of games for the console. Payment card systems generally charge merchants a usage fee but no access fee. If your costs scale with usage as many cloud businesses do, it likely makes sense to have a usage fee. However, access fees can also help to ensure quality of users on the platform by setting a minimum price bar. Cardholders care about card acceptance, for instance, while merchants care about usage. It thus seems sensible not to charge merchants for access and not to charge consumers for usage. Platforms that process transactions often charge a percentage transaction fee. Here are some examples for reference. Strategy: Should you lower price or add value? 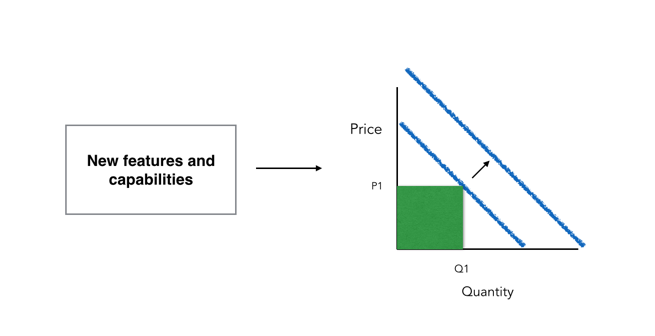 When applying strategy, should you focus on lowering price to increase quantity of users or add value to shift the demand curve out? Both will have a cross-side network effect stimulating the other side of the platform. The important question is which will have the highest return on investment in terms of network value creation. Only you can answer that through trial and error. 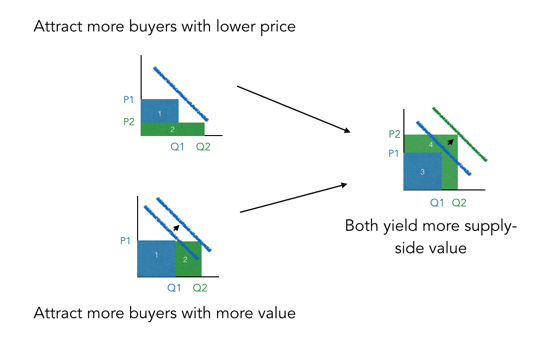 Adding value tends to allow for maintaining margins whereas lowering price can be done more quickly. Both sides of the market have very high value users which generate disproportionate leverage over the other side of the market. Generally it can make sense to subsidize the acquisition of these types of users in order to capture their leverage. All users of two-sided networks are not created equal. The participation of “marquee users” can be especially important for attracting participants to the other side of the network. Marquee users may be exceptionally big buyers, like the U.S. government. 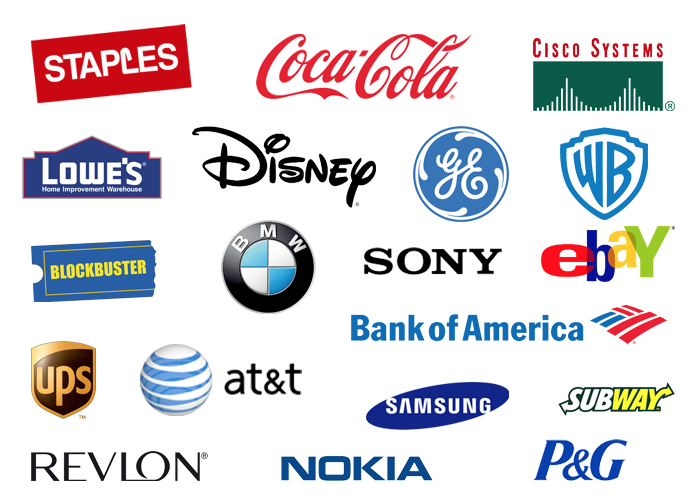 Or they may be high profile suppliers, like anchor stores in malls. Are their very high value users who you could strategically focus on acquiring that would accelerate your growth? Thank you to all those who have done research on platforms and made their research available. A list of some great references were the basis of this post listed here. Thanks to friends who have contributed feedback! this article if you found it valuable and let me know if you have feedback, questions or comments! Thanks to Hallie Benjamin and Sam Johnson.